Sharifah Halimah watches as a Customs officer scans the tax stamp on a pack of cigarettes. KUCHING: The Customs Department yesterday carried out a surprise inspection of six premises in the city as part of efforts to curb the sale of contraband cigarettes and alcoholic beverages. 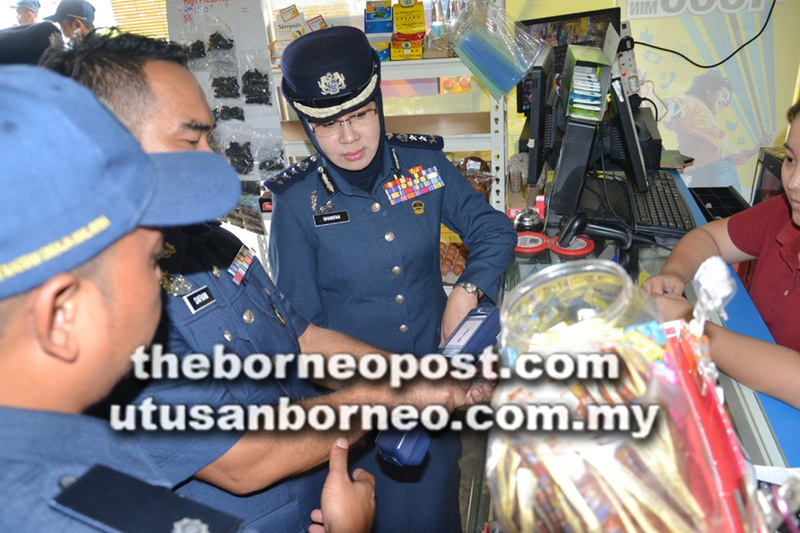 Sarawak Customs director Dato Sharifah Halimah Tuanku Taha in a press statement said the checks were to ensure traders comply with the law where cigarettes and alcoholic beverages sold have had their duties paid and possess valid tax stamps. “Of the six premises in Kuching inspected, two were found to be selling contraband cigarettes and alcoholic beverages. The department will continue to carry out such visits to ensure contraband items are not sold in Kuching or in Sarawak,” she said. According to her, the department has the ability to determine the validity of a tax stamp on the spot via its SM45 equipment, meaning anyone caught selling even a pack of contraband cigarettes can be charged under Section 135(1) of the Customs Act 1967 which carries a fine of RM100,000 in default at least six months’ jail, upon conviction. “I urge all parties and traders not to fall foul of the law to avoid being penalised. Work with us to stem the sale of contraband cigarettes and alcoholic beverages in the country,” added Sharifah Halimah. Information pertaining to the sale of contraband cigarettes and alcoholic beverages can be channeled to the department via its toll-free line at 1-800-88-8855, Customs Sarawak head office at 082-472133 or the nearest Customs office.